You can sew your own cloth diaper wipes easily, even if you have never sewn before! In fact, cloth diaper wipes are a perfect started project into the world of sewing, since they are just flat, simple rectangles of fabric. The fancy wipes that you can buy? Yep, just flat, simple rectangles of fabric too. Why pay for those when you can make them yourself so easily? If you are planning to cloth diaper I understand if sewing your own diapers seems like too big of a project. However, you'll still need cloth wipes and there is no easier diaper crafts project than this one. 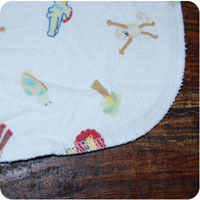 Cloth wipes are easy to just throw in the wash with your diapers and they are softer and more gentle for yoru baby too. My favorite fabric combo for these is to use a double layer of cotton flannel and cotton jersey (aka: tee shirt) material. 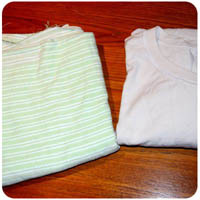 I found an old white tee shirt in my husband's drawer that he never wears and I used a thin cotton flannel receiving blanket for the other layer. Totally free materials! 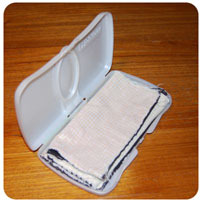 I like to use standard measurements so that I can fit my cloth wipes folded up in a travel wipes case. A good cloth diaper wipes size is 8" by 8" or even 8" x 12" for very messy jobs. Trust me, you'll appreciate having a few of the bigger sized wipes that fit over your hand! Simply cut an 8" x 8" square of cotton flannel and a matching 8" x 8" square of your teeshirt material and sew them together. 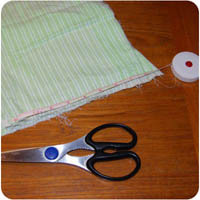 No need to turn inside out, you can simply use a zigzag stitch around the edges or use a serger if you have one. For those of you with a serger, you can get "fancier" and do rounded serged corners if you like, but this is totally optional! They will function just the same, but some people prefer the professional look of rounded edges. Another cheap solution is to use just one single layer of terrycloth fabric. You can find soft, velvety terry fabric at a fabric store that would make divine wipes. For the thrifty set, an old towel can be cut up into squares and just stitched with a zigzag stitch or other decorative stitch around the edges to prevent fraying. These are fantastically absorbent and stay soft and thick. I have a batch of these that I made that I love to use. 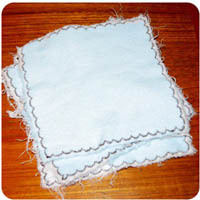 The best part about sewing your own cloth diaper wipes is that they don't have to look perfect. They are for wiping your child's bum, after all! Of course, that is not to stop you from finding adorable flannel printed fabrics to make them with! Go to the Diaper Bag Sewing Patterns Section for more project ideas! Back to the top of the Cloth Diaper Wipes page.